Welcome to Canterlot! Capitol of Equestria, and home of the Royal Sisters! From the palace, Celestia and Luna keep watch over the land, while the Royal Guards in their gleaming armor keep trouble at bay on the streets. The Royal Palace in all its splendor is the most recognizable landmark in the city, but there are plenty of other famous places around. From Celestia's school to the many grand libraries and fine restaurants, you won't get bored. Who knows? You may even run into one of the Princesses, and other very famous ponies are known to frequent the city, too. But like anyplace else, Canterlot has its darker side. From low-level thieves to scheming nobles, there's plenty of trouble to be found if you're not careful. We'll start this out as a slice-of-life/random RP, but some interesting things happen in Canterlot. Nobles plotting, Changeling/Storm King invasions, etc. Be on the lookout for the unexpected. Want to join? Just provide the following info. Talent: Writing. Carrot eating. Good in a fight, since he used to be a soldier. Personality: He's friendly and nice most of the time, if a bit shy. Has a good sense of humor, and likes to have fun. His past as a soldier/war veteran left a deep impression on him. He can get depressed from time to time, and anypony who threatens his family or friends might quickly learn how fierce he can be. He's not great with close friendships, and has a tendency to push ponies away if they start getting really close to him. Misc: He also enjoys stargazing and astronomy. Personality: Being from a minor noble family, Deshine carries herself with an easy grace most of the time. She's at home in the "upper crust" of Canterlot society. Beneath that noble exterior is the heart of a soldier. She's very loyal to her friends, especially those she served with, and can be utterly fearless. She can be impulsive, and doesn't always think things through. Current Occupation: Teaches combat magic and history at Celestia's School. Misc: She served with Onyx in Prance. Using this topic for feedback on my writings about the Great War. Give me ideas, criticism, questions, etc. here. First, basic rundown of the Great War and its causes. This plays into the background of Onyx Quill, and several of my other OCs. Feel free to make suggestions in the OOC topic. Very basic premise: When ponies left the frozen wastes of the Old World, not all of them left. Many stayed behind and drove the Windigos away by alternate means. They started to rebuild, but still didn't get along. Basically, they were Europe for most of its history. Fighting lots of wars and in general not liking each other. Eventually, they formed countries that combined members of all three tribes. They still didn't like each other, even if it was country vs country instead of race vs race. Different names from our world, but still 12 of them. The Old World calendar uses the founding of the tribes as year 0. Many of whom would eventually throw up their hooves and help found Equestria 600 years later. The founding of Equestria served as year 0 for Equestria until Luna's return. 1914 = 1314 by Equestrian calendar. RHA and AOT were minor players on the Western Front. They fought each other in Haytaly and Trotria for most of the war. Nightmare Moon returned and was defeated 2 years after the Great War ended (1317 by Equestrian calendar). That year became the new year 0 of the Equestrian calendar. The Old World kept using their calendar. It's now 1924 there. It has been five years since NMM's defeat, and seven since the end of the war. It's year 5 in Equestria. All dates are according to the Old World calendar. Before 1870: For hundreds of years, the ponies of the Old World fought in a series of wars. Against each other, and against the kingdoms of various other creatures. Prance and Germaney fought numerous conflicts for 300 years. Relations between the two countries took a turn for the better after Empress Magnifique took the throne of Prance in 1852. King Grane of Germaney became a friend of the Empress, and the two countries were able to at least partly reconcile. Equestria itself mostly stayed out of the Old World wars. In 1870 the Centaurs of the Eastern Kingdom, long resentful of the Old World ponies, launched an invasion of Germaney. Germaney is quickly in desperate straits. King Grane begs the Empress of Prance for aid, but she refuses. The war is devastating for Germaney, even though they eventually won. 1873-1913: After Germaney's victory over the Centaur invaders, the relationship between King Grane of Germaney and Empress Magnifique of Prance took a turn for the worse. Prance didn't aid Germaney against the invasion, and many Germanes were bitter toward the Prench as a result. In a meeting in Hayris, Grane and Magnifique argued bitterly, eventually breaking off their friendship. A faction within Germane nobility, led by Count Von Hufen (remember that name), began pushing King Grane to build up the military even further. They claimed that Germaney stood alone. In 1904, Count Von Hufen began pushing King Grane to launch a preemptive invasion of Prance, claiming the Empress was developing illegal magic weapons. (She wasn't. But the Count and his cohorts were). Over the next decade, Von Hufen would push for war with Prance repeatedly, but King Grane served as a counterweight and stopped it. Grane's relationship with Magnifique had been damaged beyond hope of repair, but he still didn't want to slaughter millions of Prench and Germanes. He wasn't an idiot. Tensions continued to build, however. By the end of 1913 it seemed war was inevitable. Both Germaney and Prance appealed to Celestia for her aid in any war. Celestia didn't commit to a particular side, but saw Germaney as the more dangerous and aggressive of the two countries. She pledged to stand against any acts of aggression, and to protect Hoofland, which was a partially autonomous territory of Equestria. 1914: In New Dawn (January) of that year, King Grane offered to meet with Magnifique, in the interest of smoothing over tensions. He went to Hayris. On the 28th, he was set to meet with the Empress when an assassin, who it was believed was working for Prench intelligence, attacked him with a powerful magic spell. When the smoke cleared, all that remained of King Grane was a pile of ash. The outrage in Germaney was swift and strong. Under the pretense of maintaining order, Von Hufen took control of the government on 2nd of Heart's Bounty. He vowed to investigate the King's death, and make those responsible pay. Spoiler alert: he blamed the Prench and promised to punish Prance. Von Hufen finally had his war. He accused Celestia of being complicit in the plot. Angering a sun goddess PROBABLY isn't the best idea. Grane might not have been an idiot, but Von Hufen kinda was by this point. On the 3rd of Renewal (March), the Germane army crossed the border into Hoofland. This drew Celestia's forces into the war, but it would take time to deploy them. The battle for Hoofland lasted five weeks, as the AOH put up stiffer resistance than Germaney anticipated. The Battle of Jum saw the EEF's first action on the western front. They could only commit a single division at the time, about 15,000 troops. This was an army "vanguard" division, meant to be quickly deployed to any potential trouble spot. The Germane army at Jum outnumbered them nearly 8 to 1, but the Vanguard managed to hold its ground long enough for the battered remnants of Hoofland's army to withdraw to high ground around Leapers. The EEF Vanguard division was almost completely wiped out in the process. "Remember the Vanguard!" became a rallying cry for the EEF in the war's early days. In early Summer's Eve (May), The Germanes finally crossed the border into Prance. The Battle of the Borderlands was a grave defeat for Prance. They suffered high casualties and failed to stop the Germane invasion at the border. They began a retreat back toward Hayris. The retreat lasted for nearly a month, with delaying actions that slowed the Germane army's advance. On 6/4/1914, the Prench and EEF began a desperate, last-ditch stand at the Battle of the Mane. The Germanes had over-extended their supply and communication lines, and there were gaps between some of their forces. The Battle of the Mane was a decisive victory for the EEF and GAP. It forced the Germanes to withdraw and shore up their lines farther from Hayris. Over the next months, both sides tried to renew the initiative, with neither side making much headway. Eventually, the armies dug in. Trench warfare began. As winter 1914 set in, both sides made plans for the coming year. The war is based, VERY loosely, on our WWI, as I'm sure most of you realized. First couple of years play out a lot like WWI in our world. In 1916-17, things REALLY diverge though. My Little Pony: Friendship is Magic Show Discussion / Seen the movie yet? Saw an early showing at the theater last night. Loved it. Derpy is the REAL hero. Yes. I'm being 100% serious when I say that. Resolved Issues / How do I post images? I press the "insert an image button" and put in a URL, but I can't get my images to show up. Scenario: This RP is inspired by the MLP episode "Camp Fire Tales." The premise is that you're with a group of travelling companions going from place to place by hoof. It's nighttime, and you've pitched your tents in a wooded area. To pass the time, you tell jokes, stories, sing songs, toast marshmallows, etc. It's a sign-up, because these travelling groups tend to be small. 5 ponies per group. If enough people want to take part, we can set up multiple groups out camping. Basically, it's a place to tell stories. Tall-tales, scary stories, funny stories, lovey-dovey stories, anything you can imagine. Be creative. Within the rules of course. There will be a max of five ponies per group. For every five we get, we'll make a new group. The first to sign up in a new group can set up the scenario. Try to keep it with the camping theme, but they don't have to be traveling from Manehattan to Canterlot like Onyx's group. From a young age, Onyx Quill was always fascinated by his grandfather's stories about fighting dragons in distant lands. His grandfather told stories of daring battles against long odds, and of fighting to protect his home. They provided a great way to pass the time on the small farm where Onyx lived. Little Onyx was always full of wanderlust and curiosity about the world. He often liked to run off from the farm and hop trains to distant towns and cities. This, of course, got him in big trouble with his parents. He also loved reading and, most of all, writing his own stories. The happiness of his youth was short-lived, however. When he was sixteen, his family's beet farm failed after a series of bad harvests. They were forced to leave Onyx's foalhood home in Hoofsdell and move into a homeless shelter in Hoofington. His relationship with his parents, Agate Spade and Juniper Sunrise, became especially strained during this time. He was in his rebellious "teenage" years, and their desperate financial situation made for some serious arguments and a lot of hurt feelings. Around this time, the Great War began when Germaney invaded Prance to avenge their King. Princess Celestia declared war on the Germanes, and pledged to stand against their acts of aggression. Patriotic fervor was running high in the major cities of Equestria. In the Fall of 1914 (1314 by the Equestrian Calendar) Onyx decided he couldn't handle living in the homeless shelter anymore. 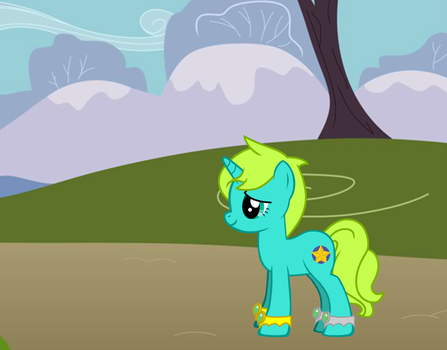 Despite his parents' objections, he left for Canterlot in Leaf's Fall (September) of that year. For four months, he kept himself busy, fed, and off the streets by working various odd jobs. He saw various recruiting drives for the Equestrian Army, and heard news from the front. Thousands of ponies, mares and stallions from the ages of 17 to 40, were joining from all over Equestria. Onyx himself gave little thought to joining the army at that point. Coming from an isolated farming village, he'd never been especially patriotic. The goings-on in Canterlot were of little interest to the farm ponies of Hoofsdell. Places like Germaney and Prance might as well have been on another planet. After Hearth's Warming 1314, Onyx was running short of money. Faced with the prospect of going back to the poor house in Hoofington, he joined the army shortly after New Years 1315 (1915). 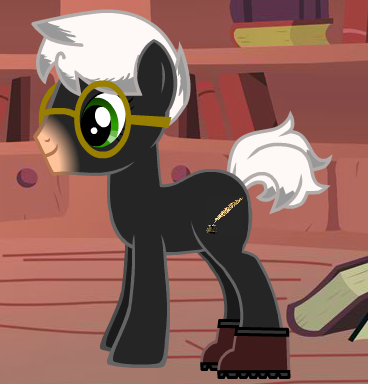 He went through basic training at Fort Hurricane near Canterlot. After passing, he was assigned to C Company of the 5th Royal Fusiliers. His unit arrived in Prance, Sun Solstice (June) 1315 (1915). They trained for six months for front line service. Onyx's first deployment to the trenches was in New Dawn (January) 1916, during the Battle of Amel. He took part in an ill-fated patrol and had to take control of the situation when his Sergeant and Corporal were both killed. For his actions, he was promoted to Lance Corporal. At Amel, he also took part in an attack on the Germane lines. He was promoted to full Corporal shortly after the unit was relieved. Onyx's unit took part in the bloodletting at the Battle of the Selle in Sun's Fire (July) 1916. C Company was part of the first wave that attacked the Germane lines at Bridemont Redoubt. Though they captured and held their objective, the cost was woefully high. Out of 154 ponies in C Company before the first two days, only 47 were still able-bodied when the 5th Royal Fusiliers were relieved on 3rd of Sun's Fire. Onyx lost several friends in that first battle. The 1st-2nd of Sun's Fire were the worst days of the war for him to that point. The Battle of the Selle went on for over three more months. During that time, 5th Fusiliers took part in several more important combat actions. Particularly at the Battle for Passendell in Leaf's Fall (September) 1916. 5th Fusiliers were rushed to the front in Snowfall (December) 1916 when Germaney launched their desperate Winter Offensive. On a ridge in a forest called the Wood of Shadow, 5th Fusiliers made a brilliant stand against the enemy. Cut off from resupply and surrounded on three sides, they held out for over a week against constant mortar and artillery fire. They faced several large attacks from the Germane enemy, but never broke. Onyx, a Sergeant by this time, was instrumental in keeping his unit's morale up and organizing defenses. Onyx would later serve in the last battles of the war in mid-1917. Germaney's army had crumbled due to mismanagement and mutiny. Their "slain" King hadn't been slain after all, and returned from imprisonment. After the Armistice between the King, Celestia, and the Empress of Prance, 5th Fusiliers got sent to Helheim Island to root out holdouts loyal to the Germane Usurper. After the last battle, Onyx served on occupation duty in Germaney itself for a few months before 5th Fusiliers were sent home. For several years now, he has traveled Equestria as a wandering storyteller/writer. He keeps himself busy to avoid thinking about the war. He has slowly started to come to terms with his experiences, and may talk about what he went through in the war to close friends. Introductions Archive / Hello hello hello! Hello everypony! Onyx Quill here! I think I'm a pony! Anywho, glad to see you all. I look forward to hanging out!